Paul R. Demers was appointed bass clarinetist of The Philadelphia Orchestra by Christoph Eschenbach in March 2006. 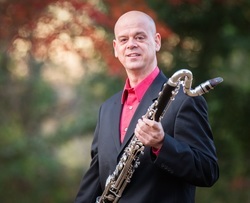 Prior to his appointment, Mr. Demers performed as bass clarinetist with various orchestras, including the National Symphony, the Baltimore Symphony, The Philadelphia Orchestra, among others. He can be heard on the Orchestra’s most recent recordings and can be seen in the documentary Music from the Inside Out playing solo bass clarinet in Tan Dun’s On Taoism. In 1997 Mr. Demers won a position with “The President’s Own” Marine Band in Washington, D.C. During his four-year tenure with the Marine Band, he performed as a member of the clarinet section, and as a soloist, chamber musician, and E-flat clarinetist. As a chamber musician, Mr. Demers has performed at the Lake Champlain Chamber Music Festival, the Saratoga Chamber Music Festival, the Kingston Chamber Music Festival, on the Bravo! Vail Chamber Music Series, and with the Dolce Suono Ensemble and the Network for New Music. He currently serves on the faculty of Temple University. During the summer months he teaches at Curtis Summerfest and the New York State School of Orchestral Studies. Born in Westbrook, Maine, Mr. Demers started playing clarinet at age 10 and began private lessons at age 14. He attended the University of Southern Maine, studying with Dr. Thomas Parchman, and then he continued his studies with Larry Combs and John Bruce Yeh at DePaul University in Chicago, where he earned Bachelor and Master of Music degrees and a Performance Certificate.